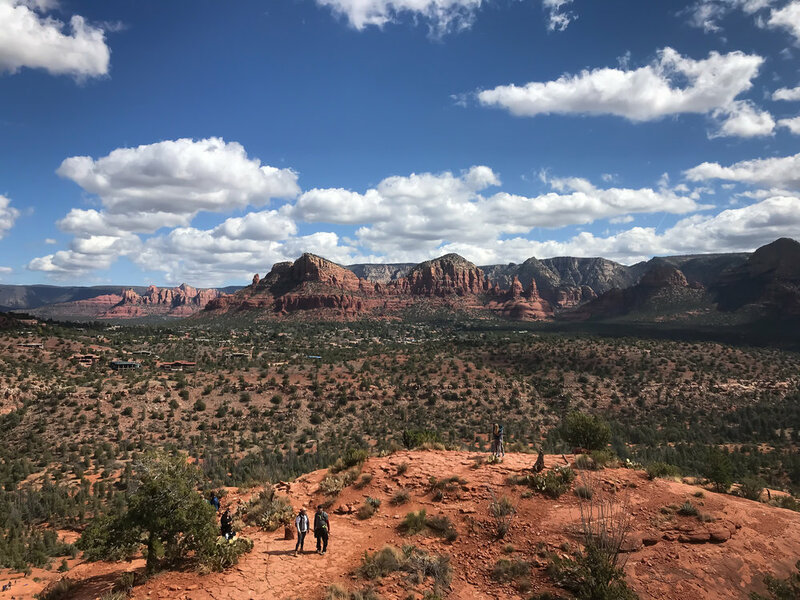 Hiking Cathedral Rock Trail is worth the trip to Sedona, worth the vulture-like hovering to get a parking spot, and worth the challenging climb to the top. Its views from various points on the trail are stunning. No doubt about it—you are absolutely rewarded for your effort. Dog-Friendly: Yes, but they must be leashed. The trail begins right off of Back O’ Beyond Road. The approach is fairly short as the total hike is only a mile long. 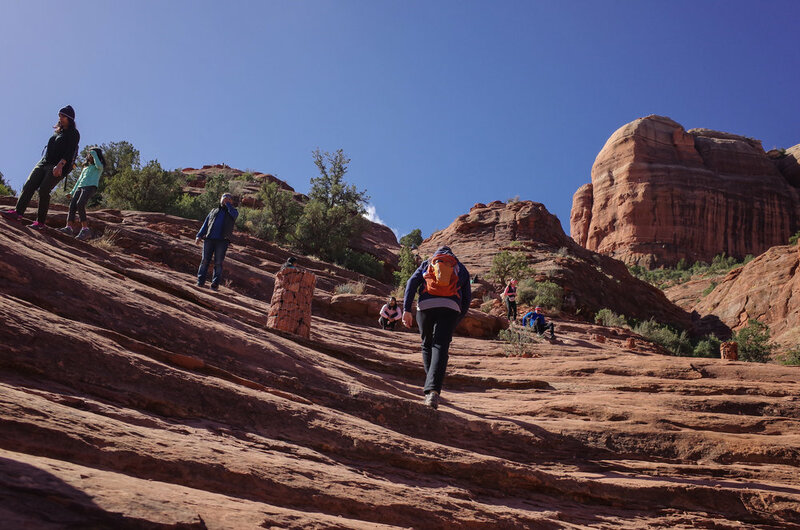 You’ll cross the junction between Cathedral Rock Trail and Easy Breezy Trail as well as a small creek before you begin your ascent. Basket cairns mark the path, and the initial climb is fairly straightforward with a clear path and occasional staircases of rocks. Just before reaching the Cathedral Rock Trail and Templeton Trail juncture, you’ll arrive at a plateau. You may want to linger there as the sweeping view of Sedona is breathtaking. Once you hike over a fairly rocky section, you’ll arrive at the base of a crevasse or cleft in the rock. Many hikers at this point turned around or waited there deciding if they were going to proceed. The crack rises at a 45-degree angle for approximately 40 ft. Ample hand and footholds make the ascent manageable, but for those who are wary of heights, this portion might be a deal breaker. During or after rainfall, these rocks might be slippery and you will want to exercise significant caution. For this cool, dry day, however, the rocks were easy to navigate. The ascent gets still a bit more challenging after you have summited the crevasse. Though the incline is less steep, the elevation gain is still significant. The sandstone seems to offer just the right-hand holds and footholds on its surface. Sometimes the rock rises in gradations, and in those sections, the climb is fairly easy. It is in two sections where the rock is high and fairly featureless that the hike gets a bit more interesting. The trail is heavily trafficked, and you can watch the different ways in which people attempt to make it up these sections. A few hikers took the rock on at a bit of a run, some cresting over and a few not making it without a helping hand from their friends. Others simply scrambled over the top, “smearing” their foot against the rock for leverage. To be honest, these sections make the hike incredibly fun. You’ll reach a second plateau area where many people rested. You can see how close the summit is at this point, and with the hardest part of the hike behind you, it’s only a matter of time before you are at the top. A steady length of the trail, a rocky staircase, and a few switchbacks past an elegant juniper tree are all that’s left. A sign at the top stating “End of Trail” greets you between the two walls of the formation, and the view over the edge is something to behold. Do exercise extreme caution on your way down. The hike is an out and back so as you climb down the crevasse, there may be other people trying to climb up. One heartening, 70-year-old hiker, with the help of her family, summited the crack to huge applause and cheering for their “abuelita.” It was a sweet sight and a reminder that though the hike is challenging, it can be a great adventure for most everyone. Take Highway 179 past Oak Creek Village. Make a left on Back O’ Beyond Road. Travel west about 1 mile. The trailhead will be on your left-hand side. Additional overflow parking is available further down on Back O’ Beyond Rd. Parking is often a challenge at Sedona trailheads if you are not an early riser. Be patient as the turnover is fairly quick. 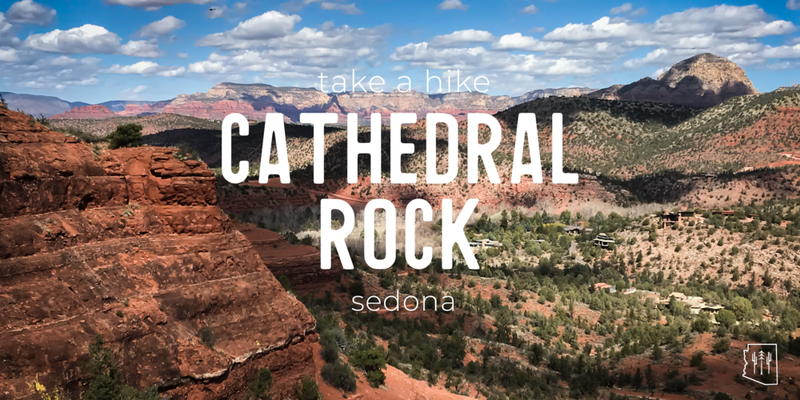 If you are not able to park in one of the two designated lots for Cathedral Rock, additional overflow parking is available at the Yavapai Point Parking Lot, which is about two miles south on Highway 179 and on your right-hand side. 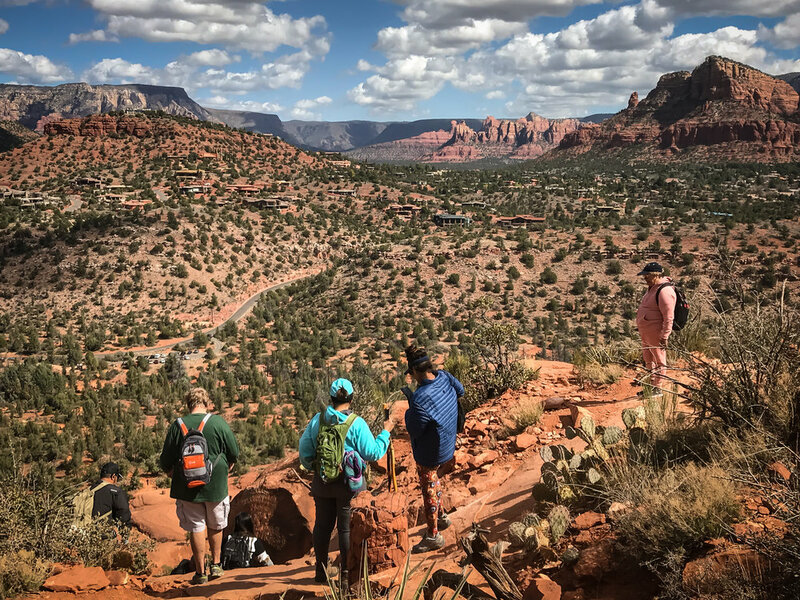 Note that Yavapai Point has less than 20 spots total and will add almost 4 miles one way to your hike via the Templeton Trail. This is a great option, however, if you’d like to lengthen your hike. You can purchase a daily pass for all Sedona trails for $5.00. The fee machines at designated trailheads accept credit cards only. America the Beautiful annual passes are honored as well. Use sun protection as very little shade cover exists on the trail and bring plenty of water. Completing the hike at sunset is magnificent. Make sure to bring a headlamp if you get caught on the formation at dark.